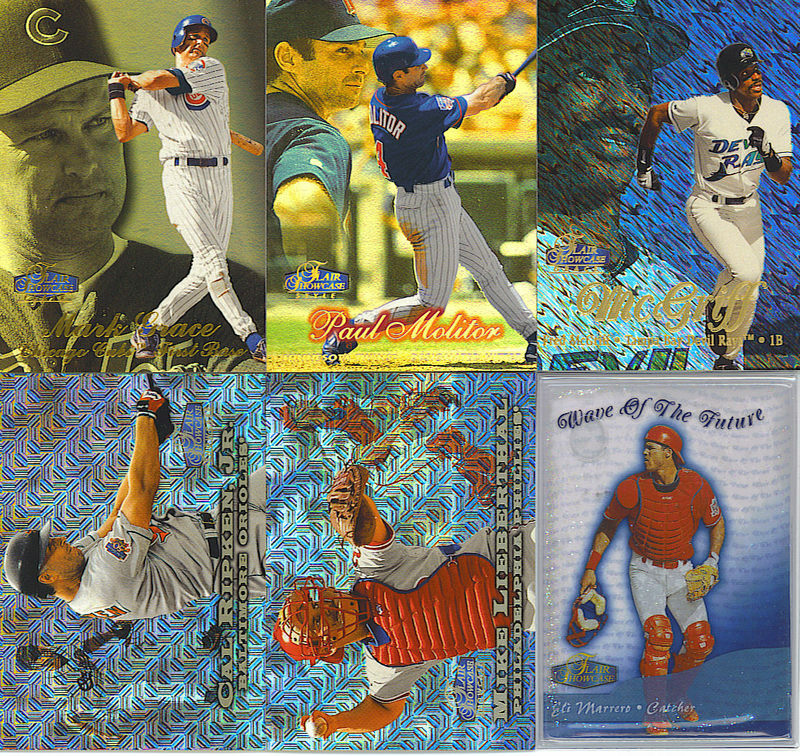 Base set: 1999 marked the last time that the Flair Showcase set was fractured. In this case, 144 players each had three cards each, Rows 1, 2, and 3. The scan above depicts cards from Row 3, the most common of the bunch. In this box, I pulled 71 Row 3 cards without duplicates. Row 2: The Row 2 cards came at a rate better than one per pack. 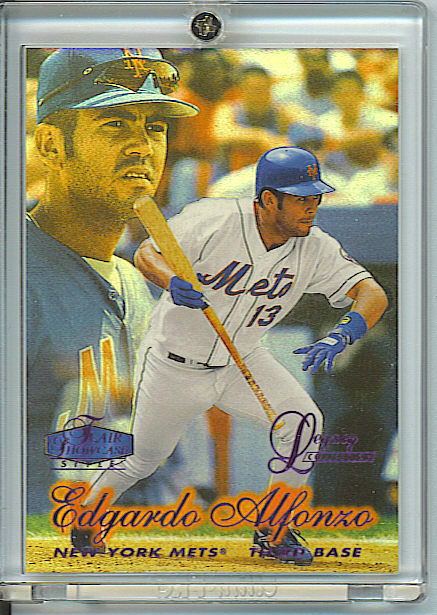 In 1999, the look for these cards was tweaked a bit from those of previous years as the players no longer had their distant background images but rather a small action shot placed under a giant model of their uniform number. The number concept might seem a bit tacky, but the cards are beautiful regardless. I pulled 40 different Row 2 cards in this box. Some of the notables included Mark McGwire, Cal Ripken, Jr., Vladimir Guerrero, Ivan Rodriguez, Pedro Martinez, Curt Schilling, and Mike Mussina. 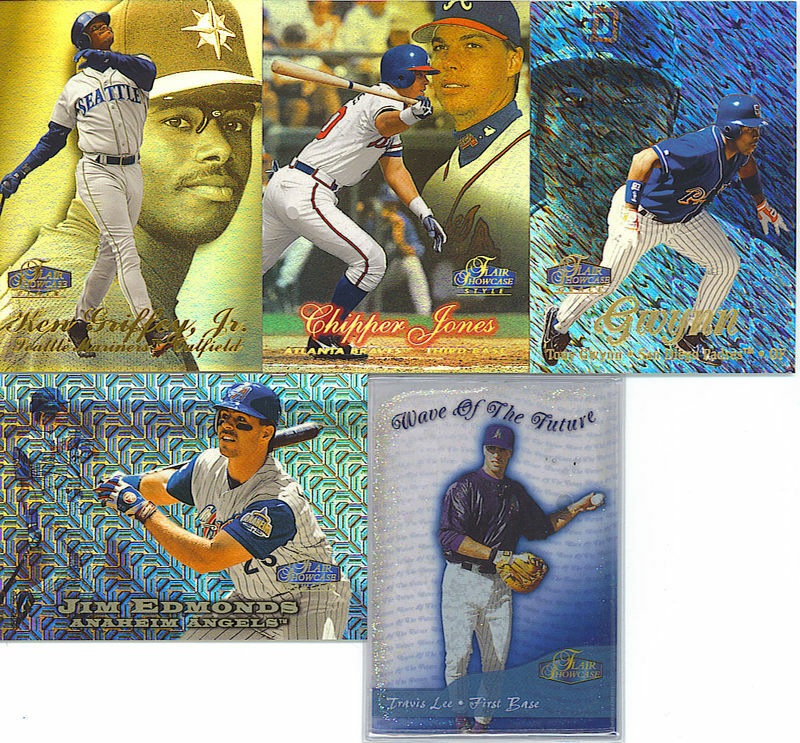 Legacy Collection (/99): The low-numbered, blue-foiled Flair parallel known as the Legacy Collection returned in 1999 and mirrored all three Rows with a print run of 99 each. I was unable to pull a Legacy card in two boxes of 1998 Flair but I was able to hit one here in Andres Galarraga (63/99). Wave of the Future (/1000): A staple of the Flair Showcase line, this year’s Wave of the Future inserts returned with a special technology later used in Fleer’s E-Xceptional inserts. I pulled an insert of Troy Glaus (0979/1000). Ben Grieve, Travis Lee, Todd Helton, Eric Chavez, and Ricky Ledee are among the others featured in this set. This box didn’t contain a single duplicate and I actually got two more cards than I was supposed to (122). While the base cards were relatively unharmed, the inserts had some serious issues. Some Row 1 cards suffered from serious peeling around the edges on the back. 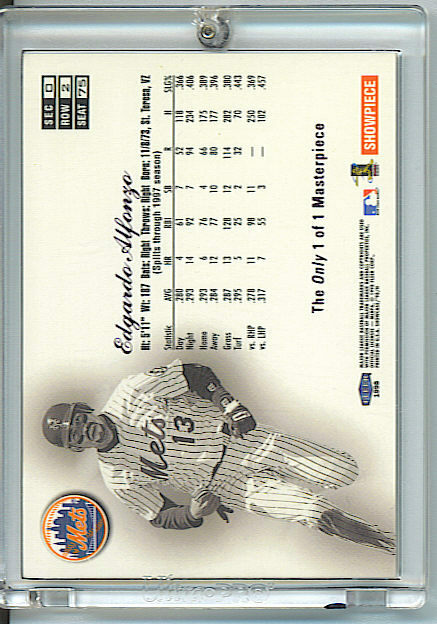 Also, check out the faded foil on the Legacy logo on the Galarraga card. This was a bit disappointing. The pulls earn a solid ‘B’ thanks in part to the Legacy card. From past experiences, I know that these aren’t guaranteed pulls. Overall, the star power in this box was above average. The asking price of these boxes are regularly in the $55-60+ range. At $45 (again for those that will ask, I don’t include the shipping in the prices I list because I often buy boxes in bunches and don’t calculate how much I spent on each), the box is worth it for the slick look of the cards alone. Throw in some awesome inserts and hard to find parallels (including possible 1/1’s) and this box is a winner, assuming several of your inserts don’t get damaged. Row 3: This box yielded 73 Row 3 cards, with 2 dupes. The other box had 78 cards with 1 dupe. I should be close to finishing this set, but the last 30 cards are slightly shortprinted. I still have to figure out how many of these exactly I need. I got lazy, sue me. Row 2: I pulled 30 of the Row 2 cards, which was 1 more than I had in the other box. Some of my notable names included Greg Maddux, Chipper Jones, Manny Ramirez, Paul Molitor, Jim Thome, and Curt Schilling. I doubt I will try for this set so if anyone is looking for a certain team, I’ll gladly search for you. Row 1: There were 10 Row 1 cards in this box, again 1 more than the other box. The notable players here included Sammy Sosa, Fred McGriff, Jay Buhner, and Robin Ventura. Again, there are all available if anyone needs them. This particular box yielded cards of Mike Lieberthal (/2000), John Smoltz (/1000), and the big hit: Cal Ripken, Jr! (/250). I have been quietly attempting to put this set together since around the time of last year’s World Series. I currently have 84 of the 120-card set, with 3 very key pieces incoming. I had never even seen a Ripken until I pulled it out of this box, so that hit made it really worthwhile to me! Wave of the Future (1:20 packs): It was Eli Marrero. Enough said. What WASN’T Pulled: Neither box contained a Legacy Collection parallel, Masterpiece parallel, or Perfect 10 card. The Perfect 10 cards are limited to 10 (with only 10 cards in the set) and as you probably know, the Masterpieces are all 1/1’s, so it’s not surprising I didn’t pull any of these in my boxes. However, neither one contained a Legacy Collection parallel, which was a little bit of a surprise to me. There are no stated odds on these, except for the fact that they’re limited to 100. I figure these probably fall in every other box or so, given the production totals compared to the 1997 version. Final Thoughts: This is a fairly difficult box to obtain, and can be pretty pricey. I’ve seen a couple of these in ebay stores for close to $100, but was able to pick these up for about half of that. The cards are absolutely beautiful, but the fracturing of the set may drive some collectors insane. Personally, I’ve always liked it, but that’s just me. For those that enjoy chasing tiers of super-premium base cards (i.e. Gold Label), this set is for you. I would definitely recommend trying a box of these, but not necessarily for the prices I saw in the stores on the ‘Bay. There are some bargains out there on this box (trust me! ), just keep your eyes peeled! Also, if you have any of the Row 0 cards numbered to 500 or less, LET ME KNOW! As always, thanks for reading and good luck with your breaks, new or old! Thanks for the read. Feedback is appreciated as this was my first actual review.